As promised on our introductory episode yesterday, This Week in Lotus has been submitted to the iTunes store podcast directory. In super quick time, I’m pleased to announce that we’ve been approved and our listing now appears in the directory. If you’re an iPod, iPhone or even an iPad user, you can now get your hands on our forthcoming episodes by subscribing (or downloading) via our iTunes link. Exciting, eh? 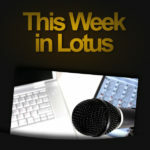 ← Here’s one session at Lotusphere you cannot miss… This Week in Lotus – Live!